I really liked the tiny Ohto Rook so I decided to give the larger Ohto F-Lapa (Jet Pens) a try. 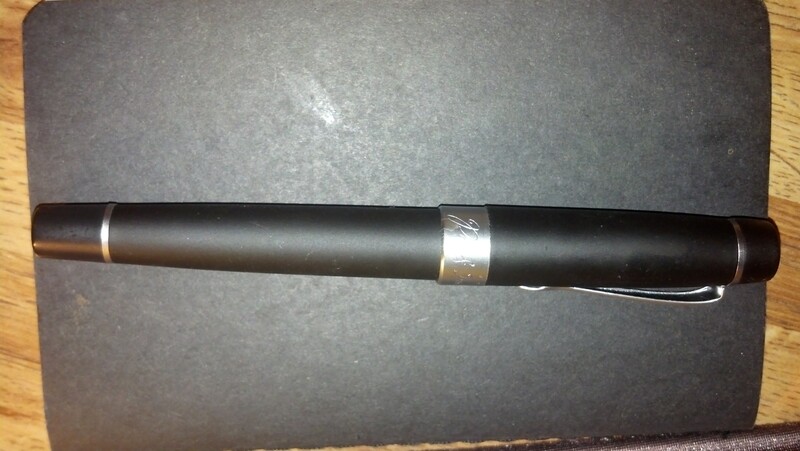 The pen is designed to look like a fancy pen as seen in every yuppie lawyer movie ever. It does look very nice and is extremely shiny (as you can see in my crappy pictures). 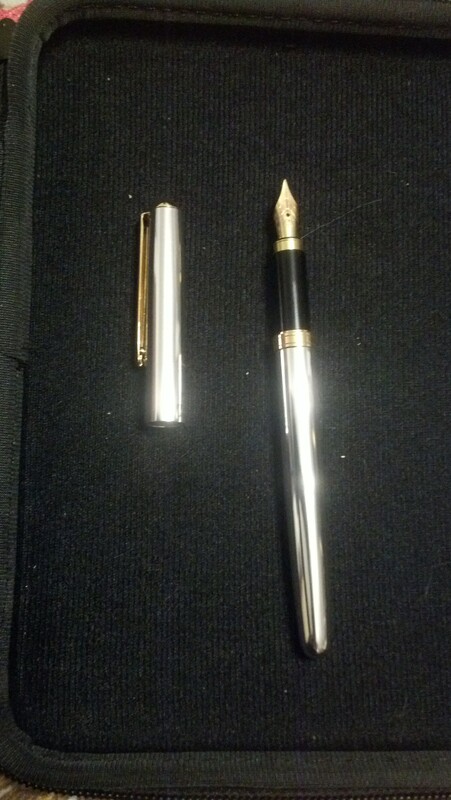 However, as soon as you pick up the pen you can tell it is not the expensive sort of pen it resembles. It FEELS like a cheaper pen. Not necessarily in a super bad way, but if you’re trying to look like a big shot, don’t let anyone hold it. 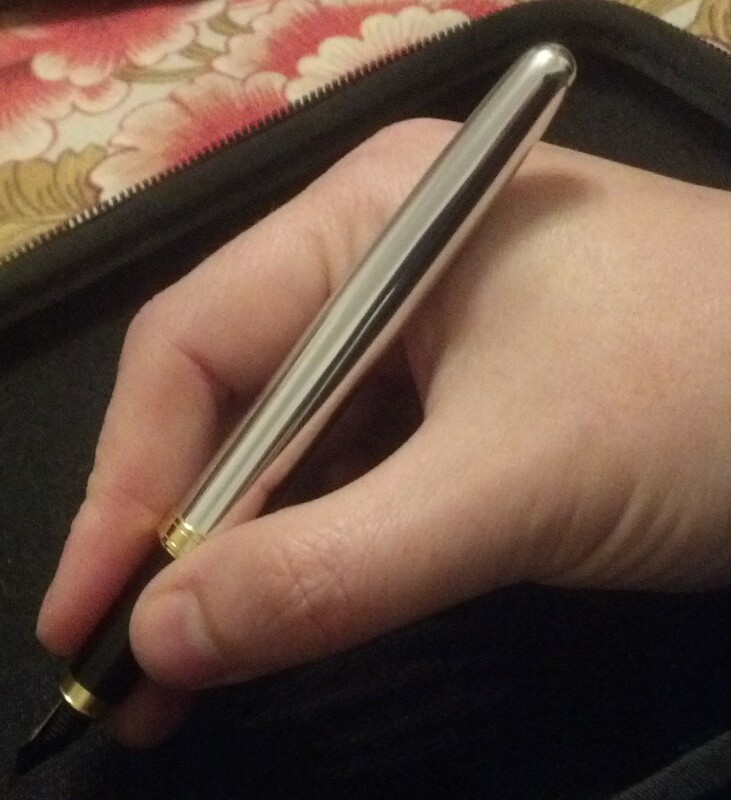 The pen has a black plastic grip that is eerily comfortable. Seriously, I was not expecting it to feel as nice in my hand as it does. It’s the sort of material that seems to hold a little of your body heat so it feels nicer against the skin than the metal parts of the pen. Now, that might be me since I do have something like arthritis in my fingers, but it’s a nice touch. 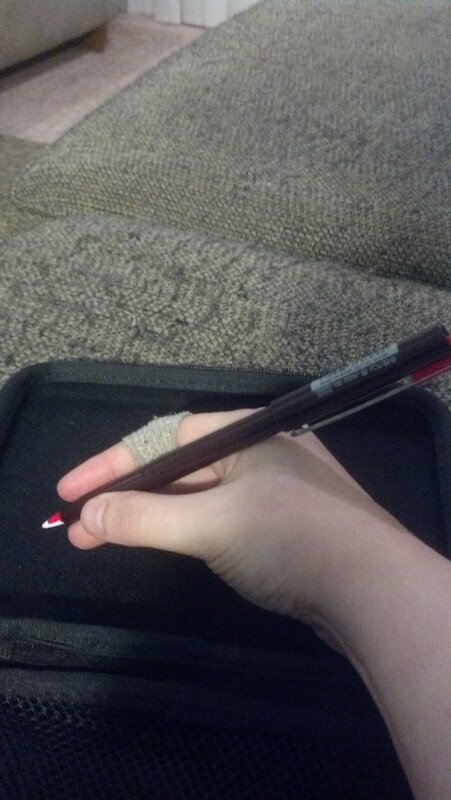 The pen is surprisingly light. 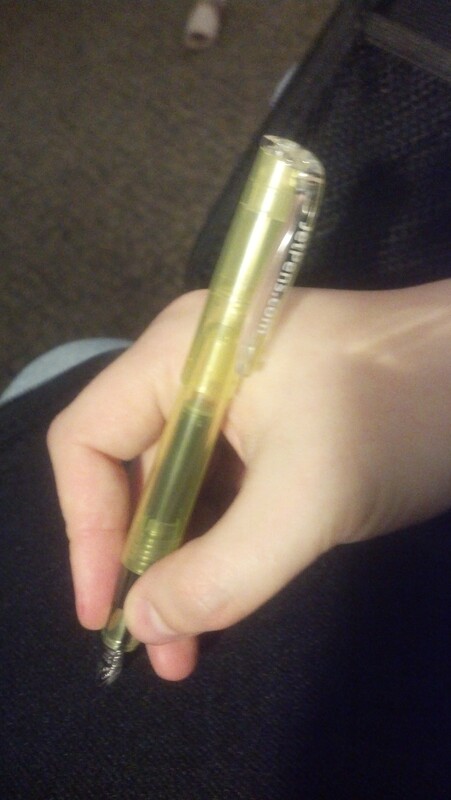 Even though it is a little bigger than some of the pens I prefer, it is very comfortable for me to use weight wise, and it isn’t uncomfortably big even with the cap posted on the back. 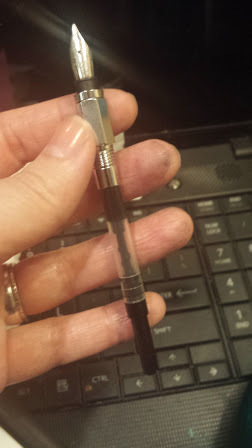 The black plastic does not fit flush against the metal part before the nib, which is good because it keeps your finger on the plastic, but there is a bit of an edge there that, while it doesn’t dig into my finger, I think would get annoying if I was writing at length with this pen. I kinda like it. I’m looking forward to using it more, so clearly I don’t hate it. I may take this to work to use as it looks impressive even if it doesn’t hold up to hands-on scrutiny. 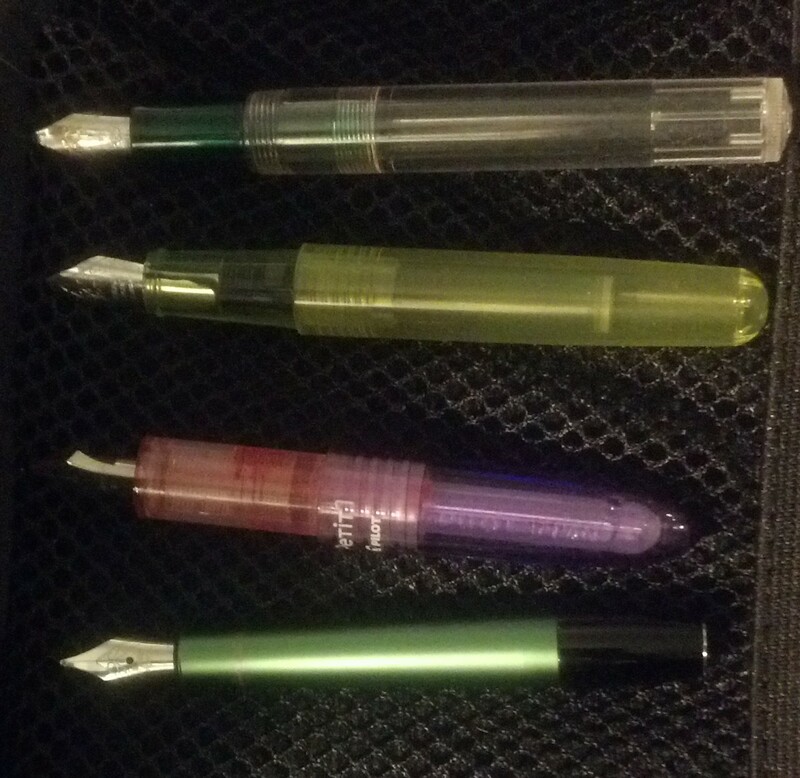 So, you can probably guess that I bought a bunch of cheap fountain pens I didn’t already own. I am doing this blog feature just about weekly so if I was buying all the expensive pens I’d probably already be broke and destitute. I bought The Pentel Pulaman strictly off the price and a “huh, that’s weird” glance at the nib. It is a very unique pen. 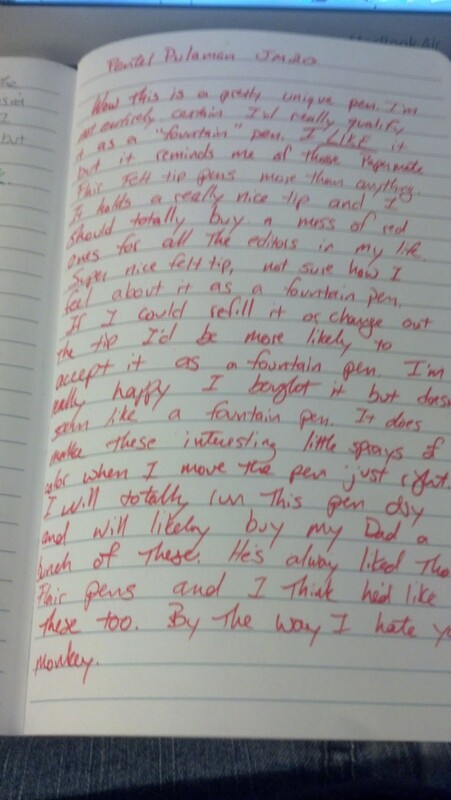 I’m just not sure it’s really a fountain pen. 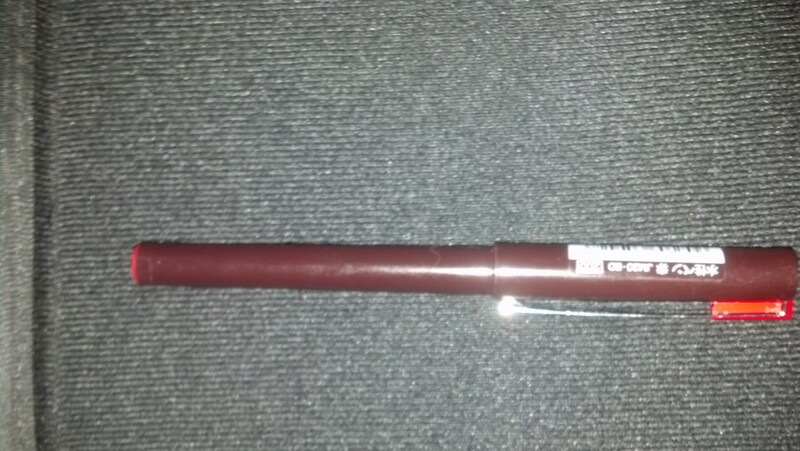 I’m looking forward to running this pen dry because I am dying to take it apart without covering my house in red ink. 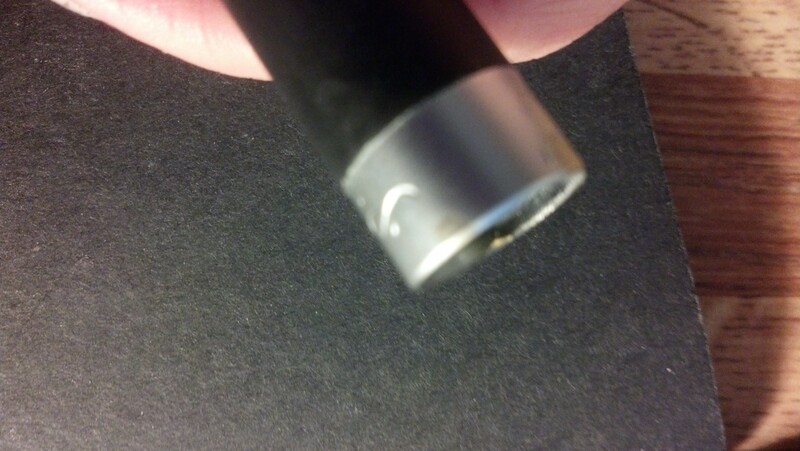 It has a plastic delta-wing shaped tip that appears to have a core running through it that feeds the ink. Honestly, it reminds me most of a Papermate Flair pen. It writes like a Flair pen, and with certain motions it makes a fine splatter of ink on the page as I loop a letter or shift the tip. I kind of like the effect, but it would annoy the crap out of me if I was trying to write very precisely. It’s a very standard pen size. Feels pretty much like using a felt tip pen. I think it would make a killer redlining pen or homework correction pen. Buy it for all the editors and teachers you know. I just can’t consider it a fountain pen. 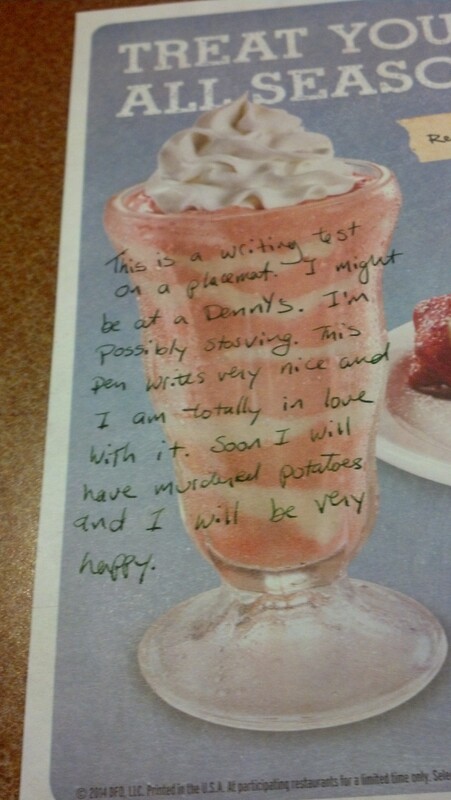 Overall Grade: Well, as a Fountain Pen I’d say on an A-F scale it’s a Potato. 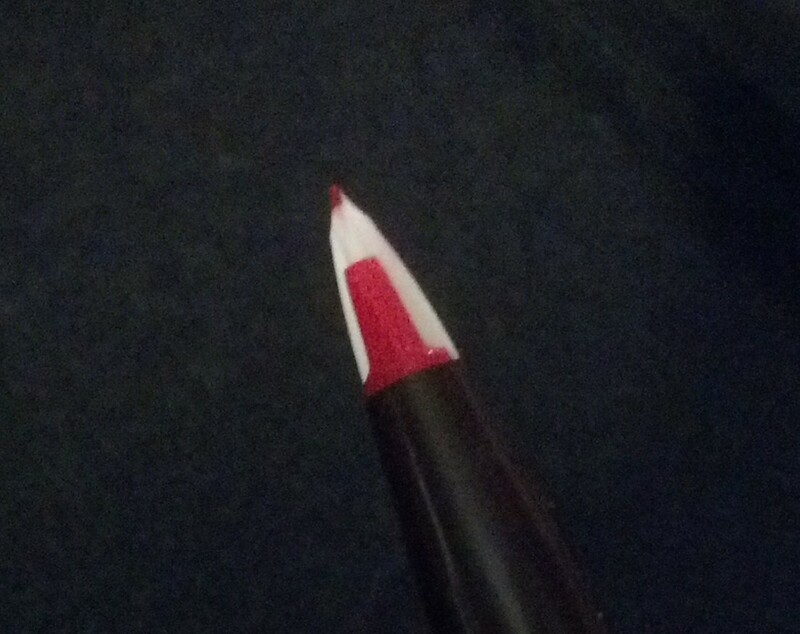 On a scale of A-F for felt pens, it’s an A. It’s just not what I think of for fountain pens, even disposable ones. 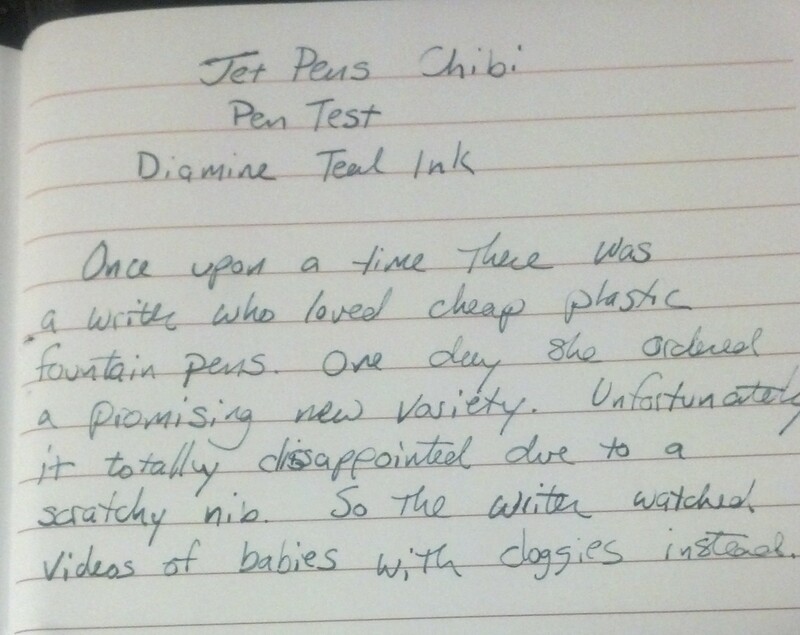 When I found out JetPens was now offering their own low-price mini fountain pen I knew I had to try it. I was so excited to try this pen because it seemed to be designed with someone like me in mind. 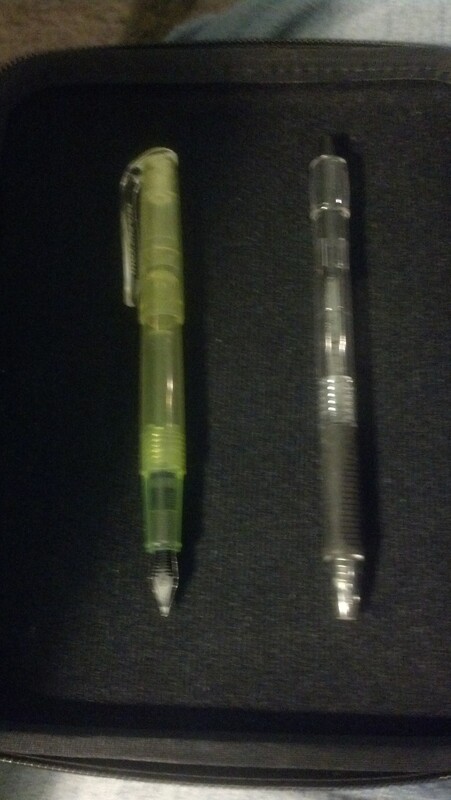 Here’s a comparison of how big it is in comparison to a standard ballpoint and a bunch of other mini fountain pens. 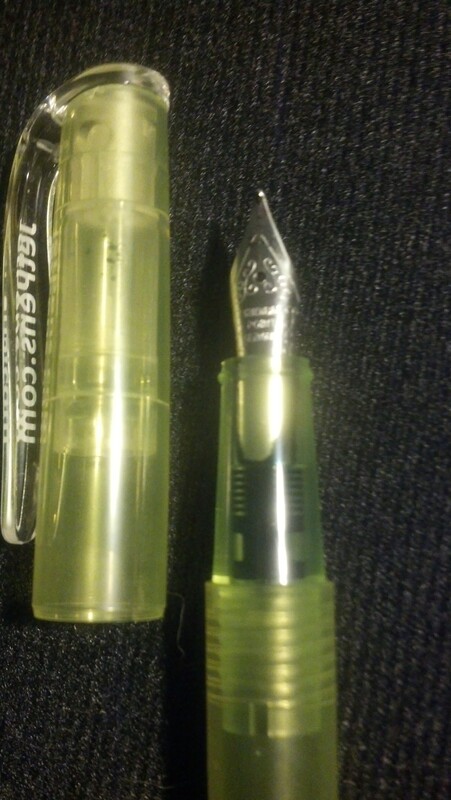 As you can see, it isn’t quite as small as the Petit1 without the cap posted, but it is smaller than the Kaweco. It’s about the same weight as the Petit1, maybe a bit lighter if they both had full cartridges in them (my Petit1 does not have a full cartridge right now). I’m guessing that it will probably do a fine eyedropper conversion but I haven’t tested it. 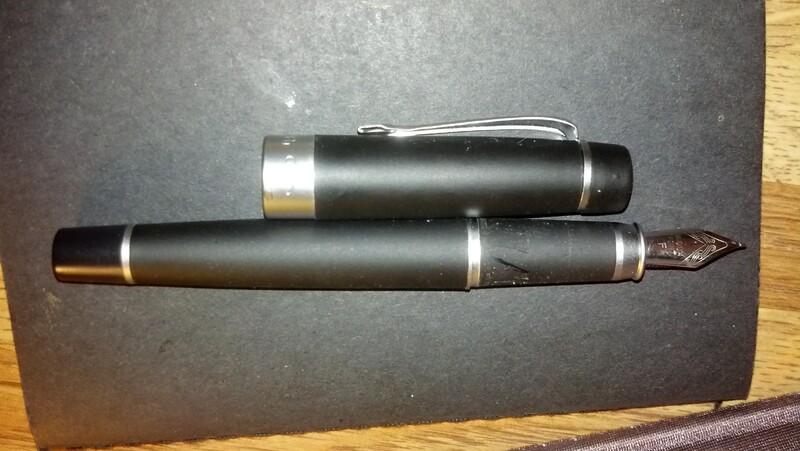 With the cap posted on the back it’s pretty much the same size as a standard pen. This pen feels really nice in my hand. 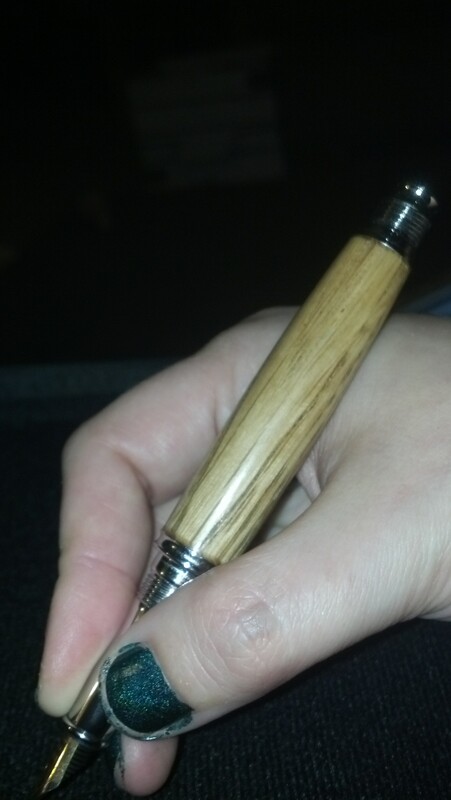 It’s nicely balanced with or without the cap and comfortable to write with. I want to love this pen. I want to love it with with the fierce passion of a bag full of badgers. The design is wonderful. I’m not a fan of the color (it only comes in transparent neon yellow) but I could overlook that. 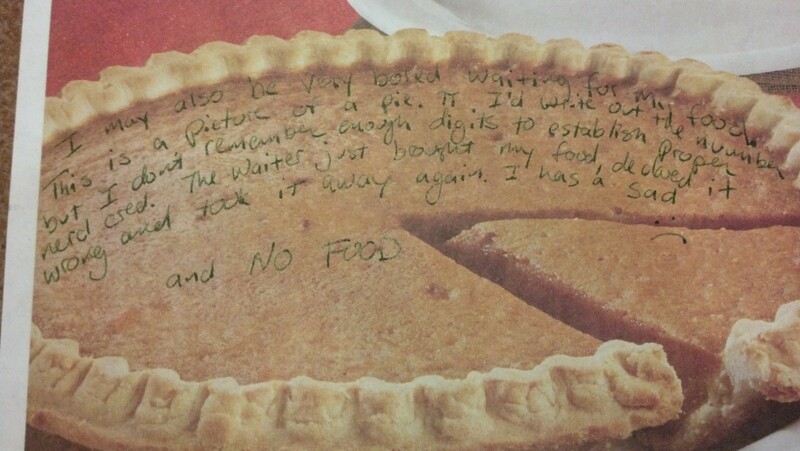 The problem is the nib. It’s just scratchy and on all the papers I tried it on it was scraping up bits of paper fiber which eventually collected on the nib soaked in ink. 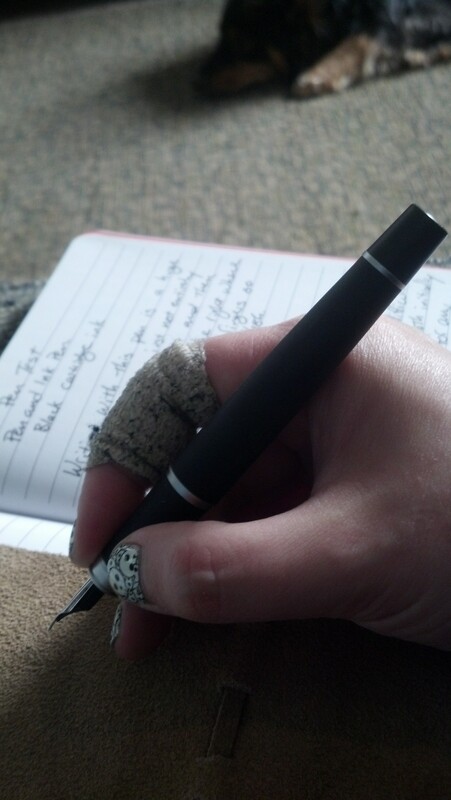 It’s not… unusable, but it’s an unpleasant writing experience. I’m hopeful that fiddling with the nib and some sandpaper or maybe even canibalizing a different nib from a different pen and gooping it into place might be possible, because I really like how the pen fits in my hand… I just don’t enjoy using it as it came. The nib problem is a pretty big problem but I’m hopeful I can find some way to doctor it to write smoother cause I really like this pen design. I’ve ordered a couple new pens to review, but didn’t have any to do a review this week. Instead I’ve asked for questions (both serious and silly) to answer this week. Q: What do you carry when you are traveling? A: This is always changing. I have Petit1 pens and the Penmanship in my purse right now, but when I go on longer trips I have various pen cases I take with a wide variety of pens and inks. I don’t think I’ve taken the same pens on two different trips. 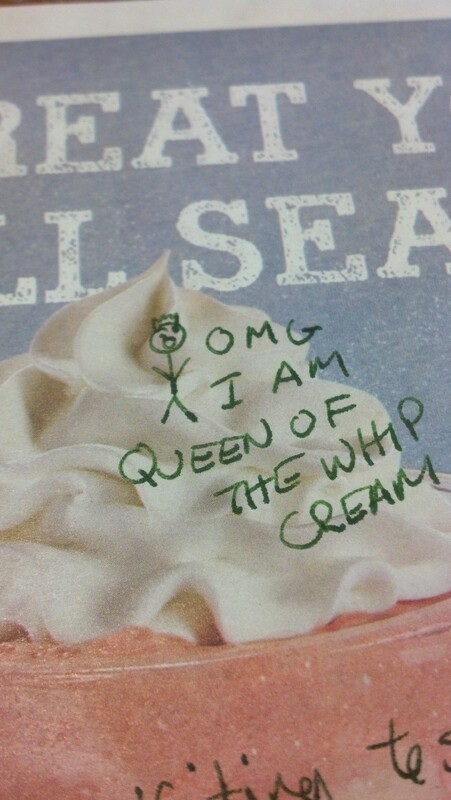 Q: What does your signature look like? 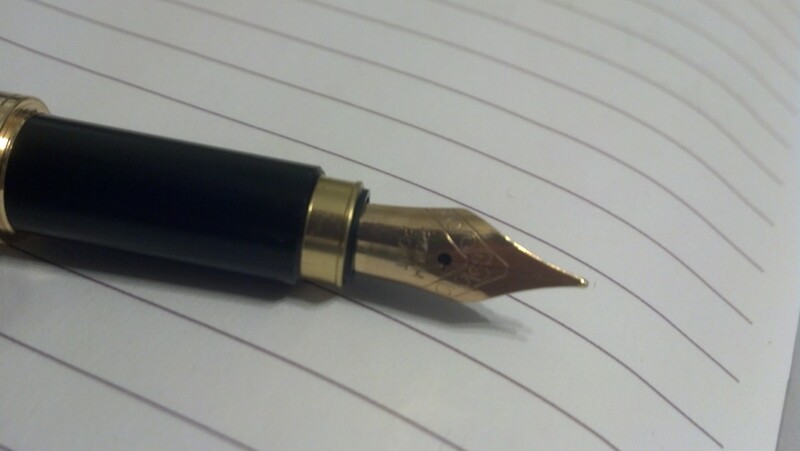 Q: When did you start using fountain pens and why? 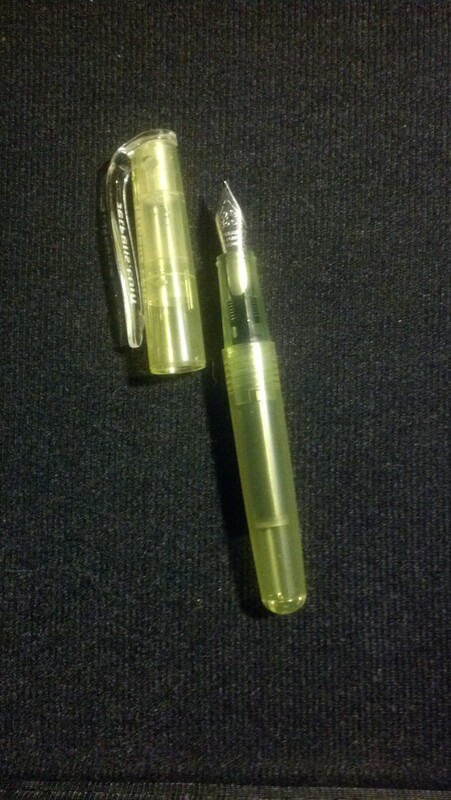 A: I bought some Pilot Varsity disposables back when they were first offered (early 90s? )… and I hated them. It wasn’t until I got discouraged at the available ink colors when I started drafting in non-blue or black colors that I looked at fountain pens again and bought myself a Lamy All-Star… and it’s been an addiction ever since. Q: If you were a tree, what kind of tree would you be? A: I pick ink based almost entirely on color, I don’t mind ending up a little smudged with ink and I don’t have good reasons to use waterproof ink so I don’t worry about ink formulas. However, that is entirely a personal preference. I’d strongly recommend if you’re just starting out to get a bunch of samples of the type of inks you’re contemplating from Gouletpens.com. Yes! Samples! They will send you a little vial of ink that will fill your average pen 2-3 times (check out their available samples here) I’ve found that the cheapest place to get standard cartridges is ebay. Proprietary cartridges and full-size bottles of ink can be bought from the same places you buy fountain pens. Amazon, Jetpens, Gouletpens and your well-stocked art departments (such as at a University Bookstore). A: Lots and lots of paper towels. Ok, I’m being a bit facetious, though having paper towels on hand does help. 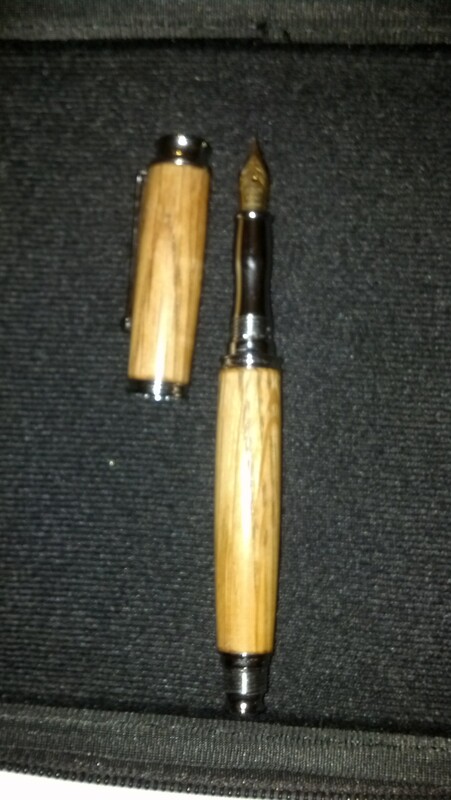 I asked for a picture of the pen mechanism in question. Ok, now cartridges are filled before they go on to a pen, but cartridges are filled while attached to the pen. I know, it didn’t make sense to me at first either. 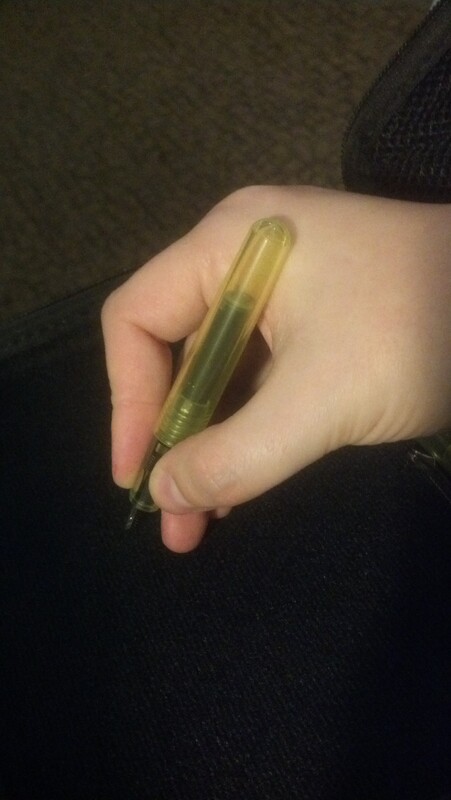 It wasn’t until I figured out you actually end up wearing a lot less ink this way that I decided to fill all my pens with the converter attached. So, with the converter attached like you see in the picture above you dip the full nib of the pen (the metal tip part) into the ink and then twist the converter to draw up the plunger inside thus creating a vacuum and filling both the pen and the converter. Tap the pen against the inside edge of the ink bottle to get rid of extra ink, and then wipe it on rag or paper towel, screw the body of the pen back on and Bob’s your Uncle. A: I… have no idea. I have honestly never tried. I work in a museum and the number one rule about museums is “THOU SHALT NOT LICK ANYTHING”. So it’s never occurred to me to try and I can’t imagine the ink would taste very good and might have stuff you’d rather not ingest in it. A: That’s a tie between Noodler’s Red-Black which is a very dark reddish color and Noodler’s Antietam which looks like dried blood. A: Wow. I’m afraid that the evolution question is a little above my paygrade. I’m just an amateur fountain pen user. I imagine someone got sick and tired of constantly dipping their dip pen (which had been the metal improvement on the quill) and decided there had to be a better way. (Let’s check the internet: http://en.wikipedia.org/wiki/Fountain_pen & http://www.calibremagazine.com/node/270 seem like some pretty good quick look at the topic). I haven’t used blotting paper myself as I have plenty of paper towels and don’t own anything I’m afraid to touch with said paper towels. As for the last question there, I’m assuming you mean when did they stop sanding nibs? 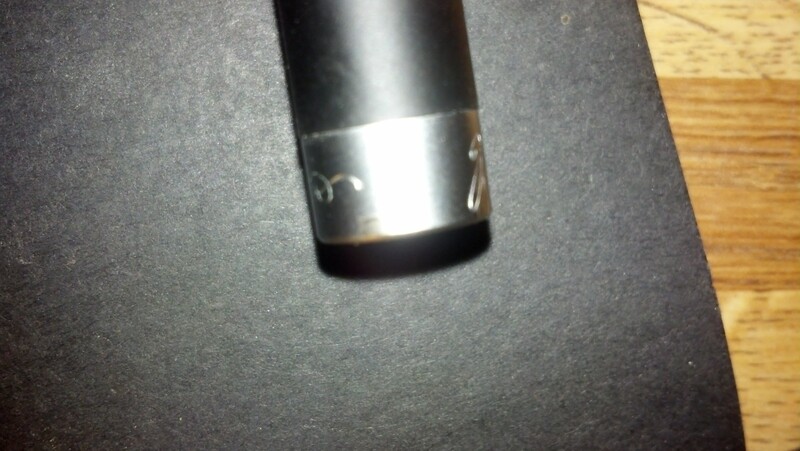 I understand that people still grind nibs to come up with customized writing instruments, but I think some of the sanding had to do with getting built-up india ink off of dip pens, but that’s outside my experience. 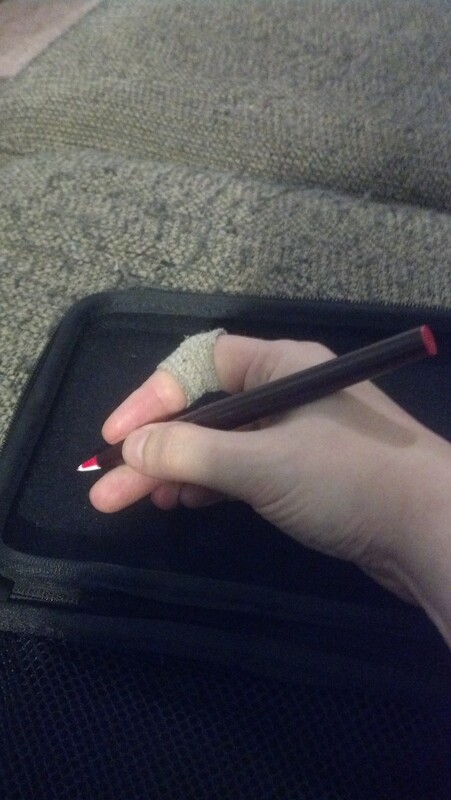 Q: Has there been any alternatives for lefties other than that wild-looking nib? 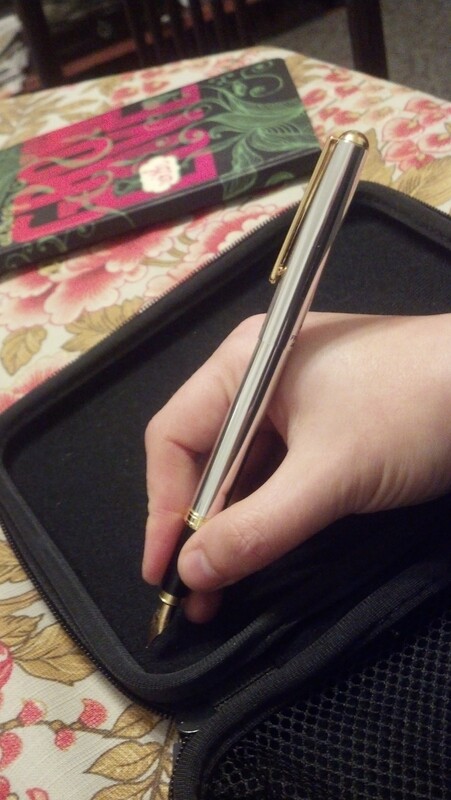 A: I am right-handed, but I do write in very small notebooks and have my own problems with smearing my own writing. So, to simulate lefty-hand-dragging directly on what you’ve just written I drew a line and followed it with a knuckle pressed to the paper. 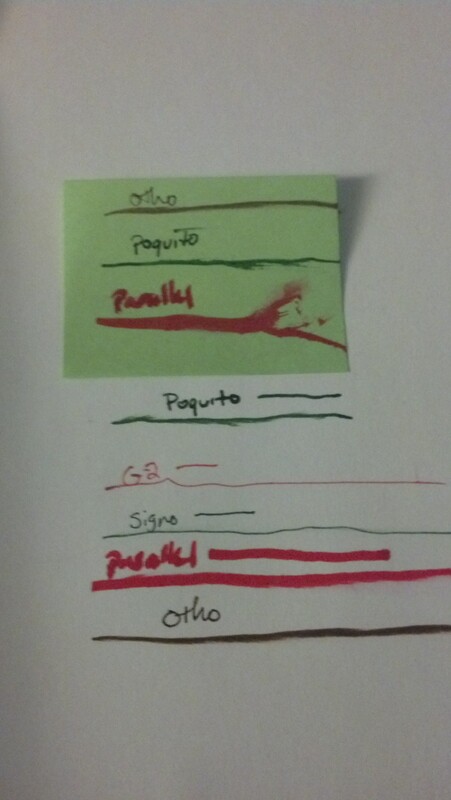 So there are three things that effect how much the ink smears are: paper, ink, and nib width. As you can see the post-it smears way worse than the notebook (Woot unlined). Also the wider parallel nib smears more than the others. I don’t keep fast-drying ink around, but that can also help. What really trips up lefties are flexible nibs because the design of how it is meant to work with the motion of right hand writing and so it ends up splattering ink. However, most of your lower-priced fine-nib pens are going to work fine for lefties as long as you don’t write on super smooth paper that holds the ink on the surface longer. 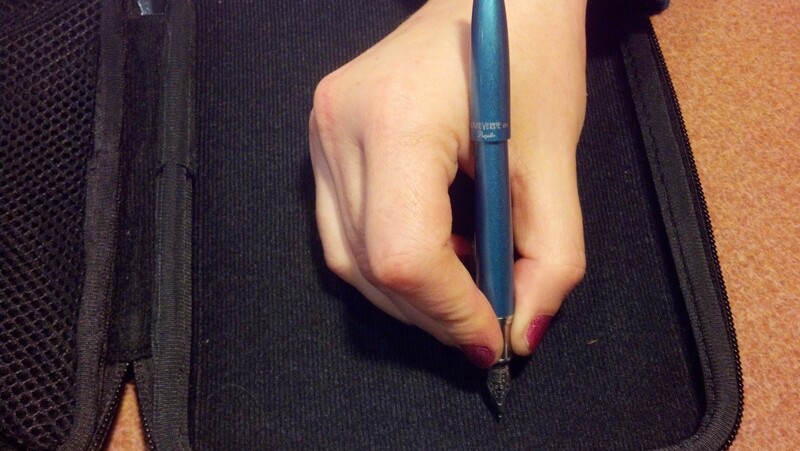 There are left-handed student pens (such as: http://www.jetpens.com/Pelikan-Pelikano-Junior-Fountain-Pen-P68L-Left-Handed-Nib-Blue-Body/pd/3562) but I can’t speak for their usefulness. A: Y’know… I think I’m going to give you a good range of stuff. I think you would really like the Petit1 not only in the fountain pen version but also in the brush pen version. 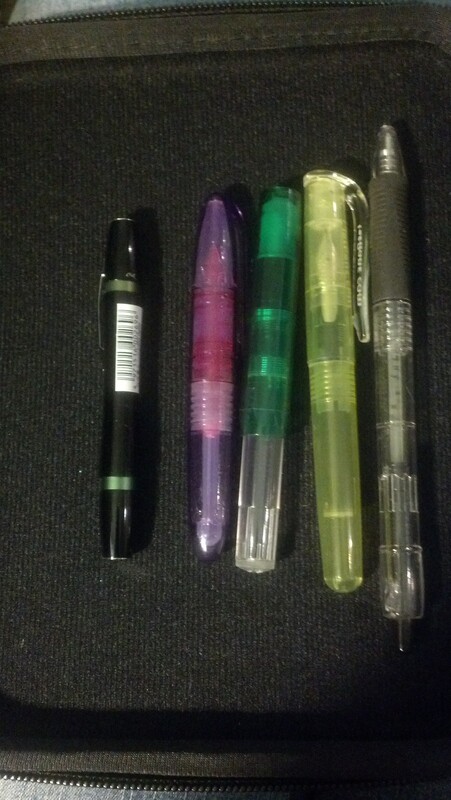 I think for writing the Poquito or the Metropolitan are pretty good starter pens. A lot of people start with the Lamy Al-star but I’m not sure it’s the best starter since it does have the ergonomic grip. 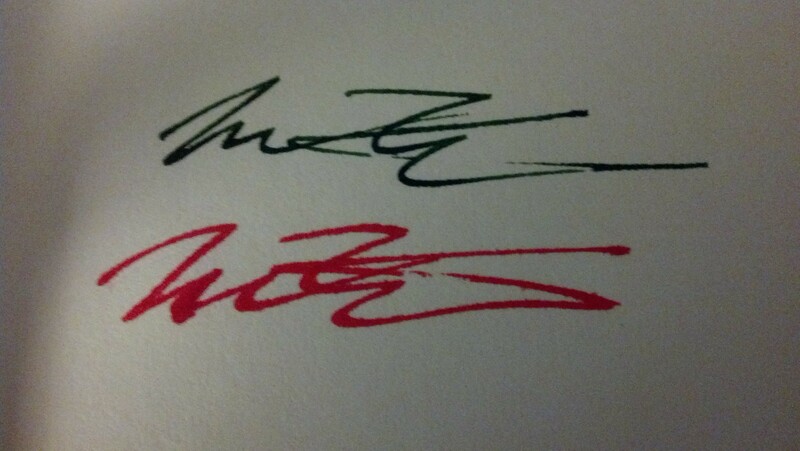 The reason I love fountain pens is the same reason I love nail polish, you can use so many colors! You also re-use almost everything so there’s less waste over other pens and using a converter it’s cheaper to use bottled ink over disposable pens (but really I’m in this for the colors). A: No. They will occasionally get a little ink on you but its no worse than any other kind of art medium. A: It depends on if the puddle is on your floor or someone else’s and how fast you can run. A: I doodle a bit, but I’m not much of an artist. A: No, it ended in a draw. 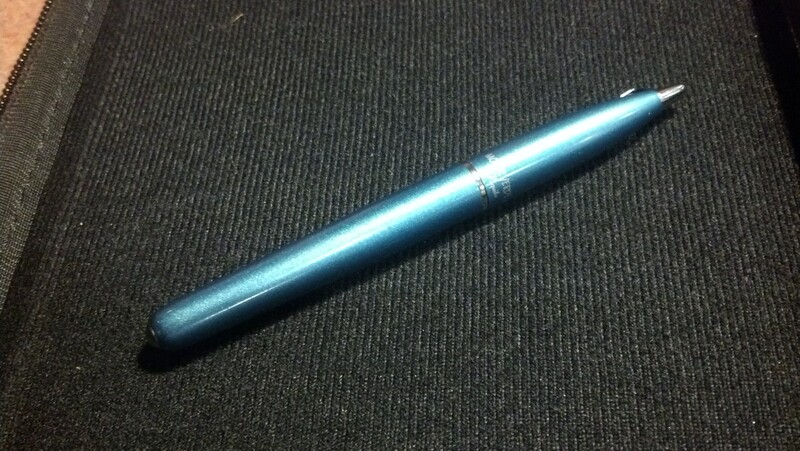 Christie sent me this pen thinking that I’d love it… and she was right! It’s entirely metal so it feels super sturdy. There’s a stylistic point at the top of the cap that looks a little weird to my eye, but I figure it might just be in case you need to use this pen in hand to hand combat to take out an enemy with a temple shot. 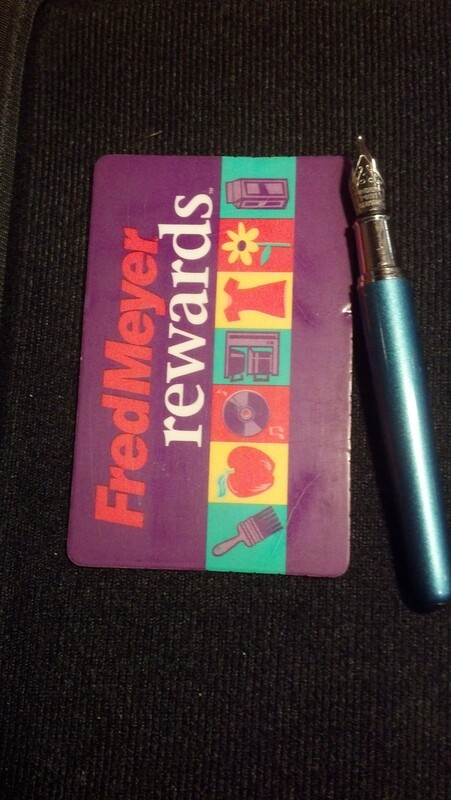 Club Card shown for scale. The pen isn’t heavy but it has a really pleasing weight to it. The cap snaps on with the absolutely most satisfying click noise. 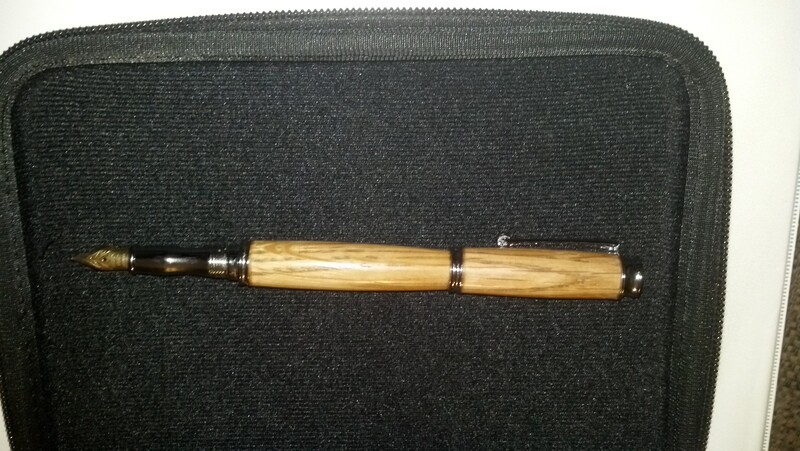 It is hard not to fiddle with this pen when you carry it. 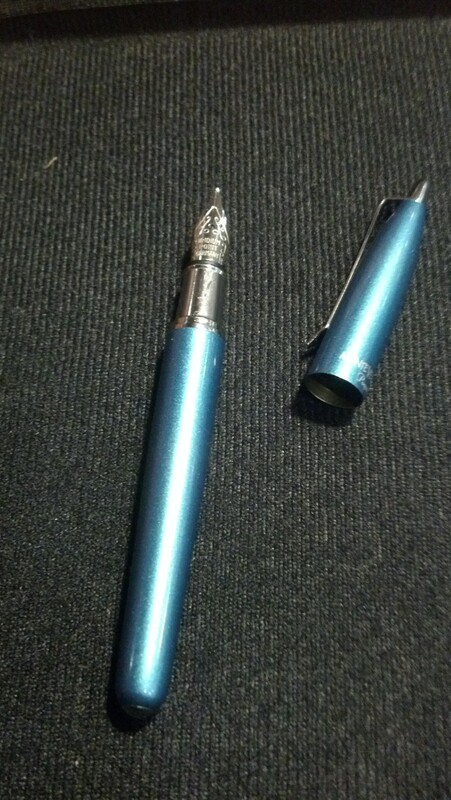 It is an adorable little pen with a metallic, almost holographic nail polish sort of color. I really enjoy how Monteverde nibs write, so I find it lovely to write with. 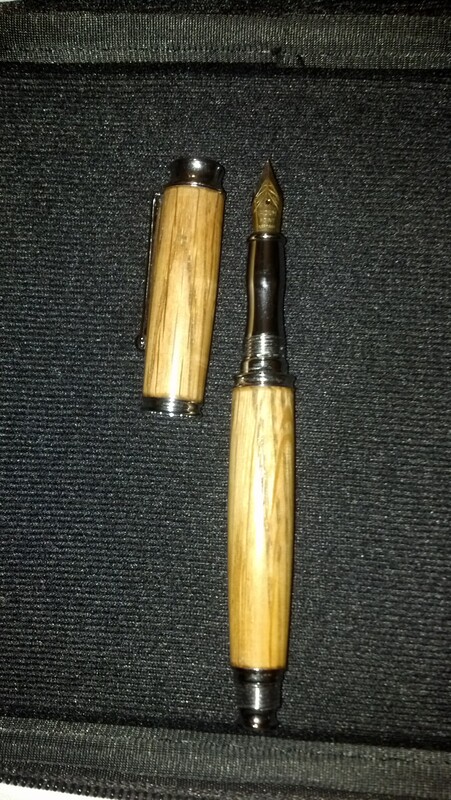 My friend Brian sent me this pen because it combines fountain pens and bourbon, two of my favorite things. 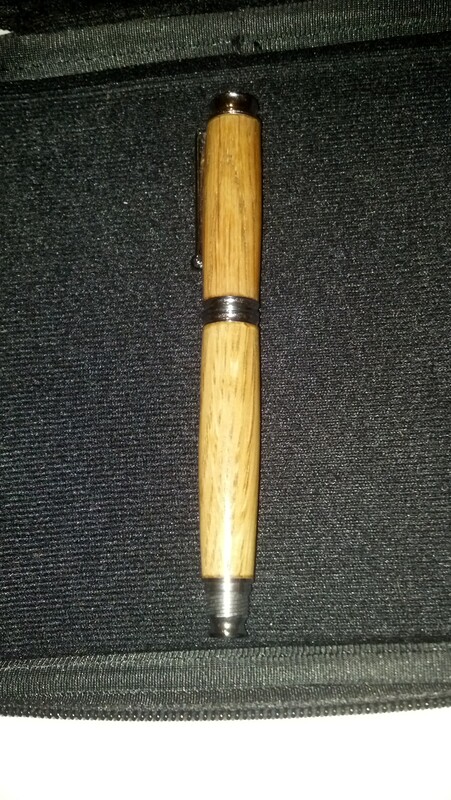 You can get your own at BourbonPens.com and you should totally click on that link and go drool over all of their pretty pretty pens. This pen is impressive looking. I was worried that it was going to be too big for my small hands, but then I took the cap off and the actual part you hold is a very nice width. The back of the pen has threading so you can screw the cap securely on the back, which is handy for those of you who like to do that. I’m personally not a fan, but this pen is very nicely balanced with or without the cap on the back. 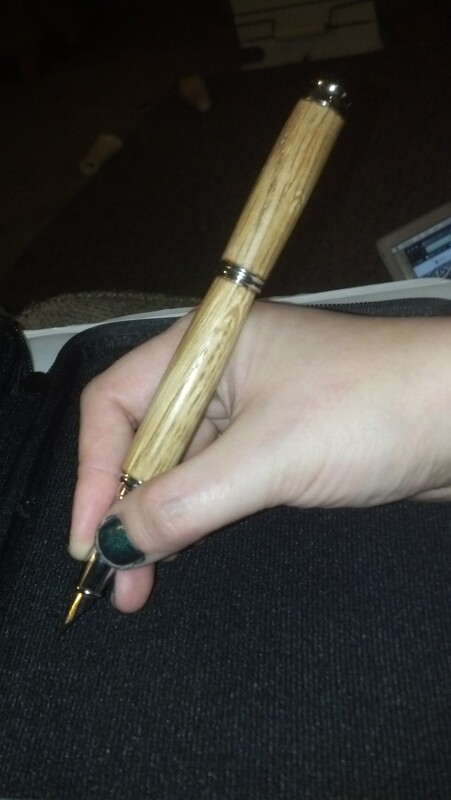 This is probably the fanciest pen I own and I feel kind of badass when I use it. It really isn’t as big as you think it might be and the grip is really nice, plus the wood feels amazing against your hand between the thumb and forefinger. 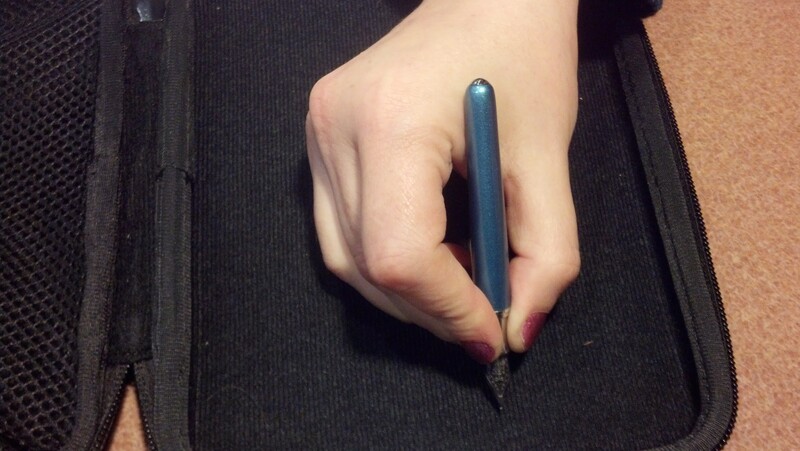 pen in hand with cap on back. It’s a little long with the cap posted, but not bad. Remember my hands are TINY. I should become a hand model for value meal burgers or something. Pen Test. 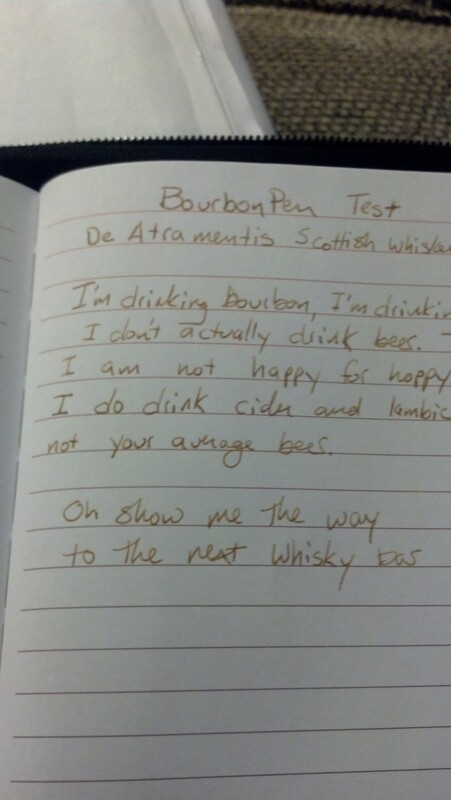 I totally had to use the whisky-scented ink to christen it. 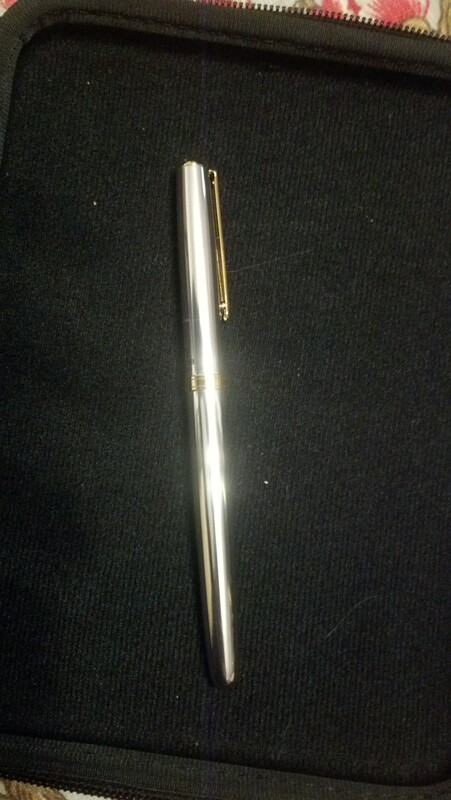 This is one of my nicest pens and absolutely the fanciest pen I own. I really like touching it and using it. Plus the pen rest smells amazing. I generally store this pen on its rest in a place of honor on my desk. It looks cool even when it’s not being used. 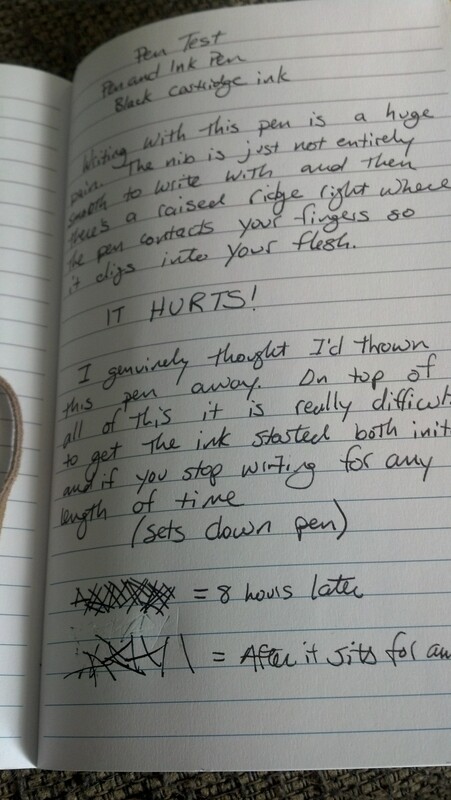 Spoiler Alert – I hate this pen. I genuinely thought I’d thrown this pen away. It’s by Pen and Ink, who happen to make my favorite small notebooks. 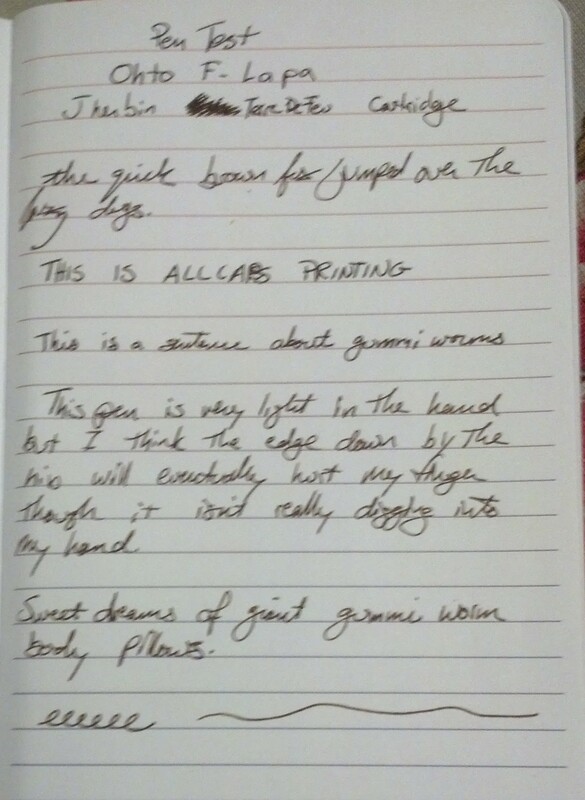 Good Notebooks. Do not recommend the pens. I haven’t used this pen very much and you can see the damage. This is by far the cheapest feeling pen I own. 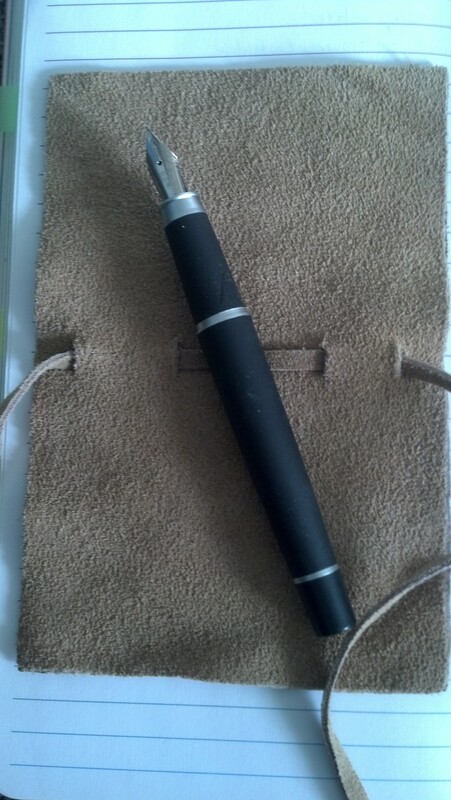 it comes with a “suede wrap” that… I guess you’re supposed to wrap around the pen at all times so it doesn’t come in contact with life lest it get all scratched and dinged up? This is also the WORST designed pen I own. 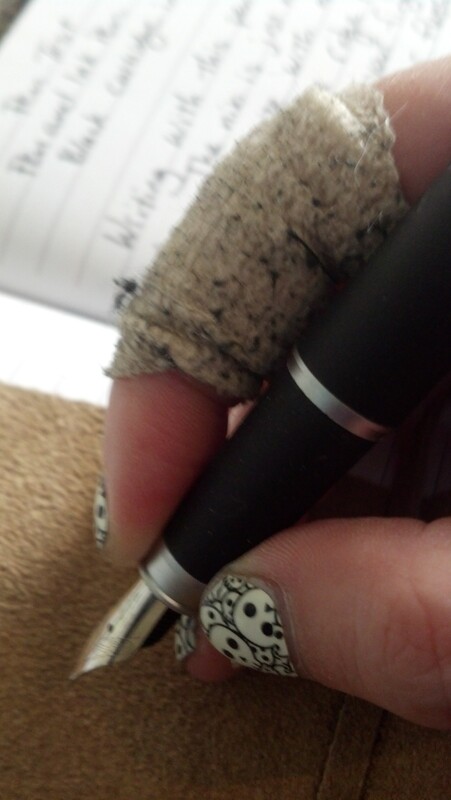 There is a raised ridge right at the end of the pen where you grip… or at least I do… IT HURTS TO WRITE WITH. The ridge digs into your fingers and makes the act of using it a horrible experience. It’s a fine size, but it comes apart easily, feels cheap and extremely light for its size. I know I know, I normally really LIKE light pens, but this one is just… I mean even the disposable Pilot pens feel sturdier than this thing. It feels flimsy. The nib is nothing to write home about either. It feels scratchy and uneven against the paper. It has the textural feel of the sound of fingernails on a blackboard. It comes with a piece of leather? 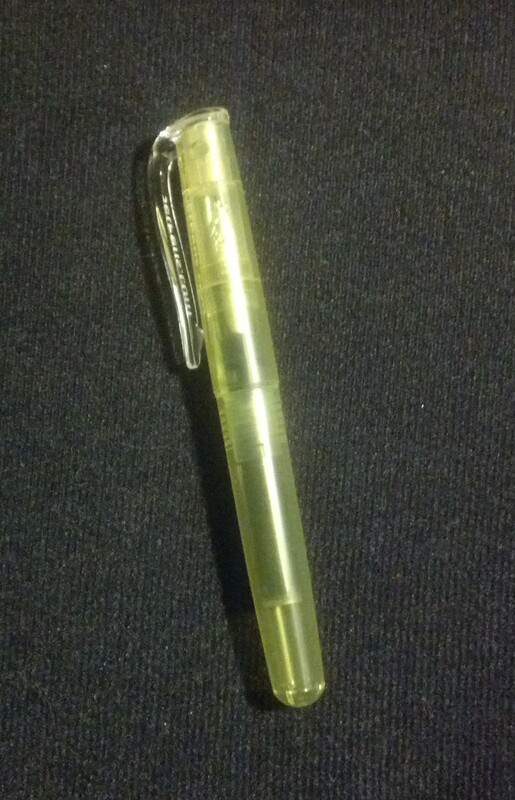 Overall Grade: F – There are a ton of cheaper pens that are better made and nicer to use than this one.